Region Free DVD and Blu Ray watch any DVD BD or UHD on any TV with the Built-in NTSC⇔PAL 4k HD Converter. 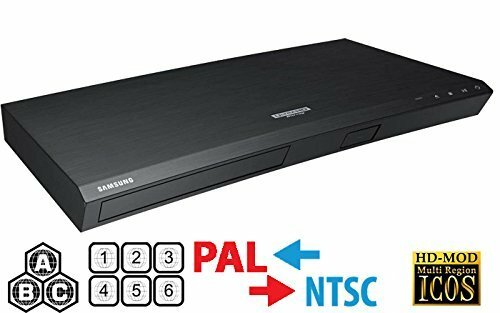 View your Blu-ray discs in 4K resolution on your compatible 4K TV with the Samsung njoy UHD Blu-ray discs on your compatible display with the Samsung UBD-M8500 UHD Upscaling Blu-ray Disc Player. In addition to handling Blu-ray and Ultra HD Blu-ray discs, integrated UHD upscaling technology allows you to enjoy optimized image quality from DVD and non-UHD Blu-ray video sources. Built-in Wi-Fi and Ethernet connectivity enable access to free and subscription-based streaming content via Samsung’s Smart Hub. This model’s HDMI output supports high-resolution audio formats such as Dolby TrueHD and DTS-HD Master Audio for a dynamic multi-channel surround sound experience. There’s also a digital optical audio output for feeding multi-channel sound to audio systems without HDMI. 4K Ultra HD Play 4K Ultra HD movies, 4x the resolution of full 1080p HD, letting you watch your favorite compatible media on your compatible display with an enhanced level of detail and clarity. Plus, with the UHD Upscaling feature, your lower-definition content will automatically refine to near-UHD for a more detailed viewing experience. HDR The UBD-M8500 recognizes HDR content for a greater range of color contrast and brightness with compatible media and a compatible display, for enhanced detail. Samsung Smart Hub The Samsung Smart Hub allows access to your favorite apps, content, and sports. Virtually Universal Disc Player Play all your music CDs, DVDs, and Blu-ray discs on one device. One Remote Compatible You can control most functions of the Blu-ray player using your Samsung TV’s remote, so there’s one less remote to get lost. Built-In Wi-Fi Sync and stream all your favorite TV shows, games, apps, and more with built-in Wi-Fi.